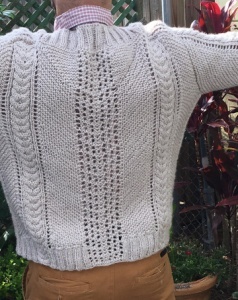 This pattern evolved from my attempts to develop a sweater with diagonal rows. 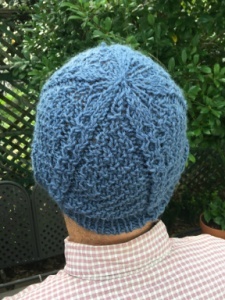 The first iteration used a simple stockinette stitch in the diagonal panels, but the unusual direction of the rows was not very apparent in that stitch. 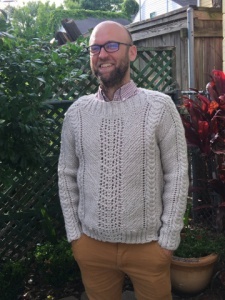 So I did another iteration with garter stitch in the panels, which nicely accentuates the diagonal direction of the rows. The concept evolved from the simple method of adding a stitch on one end of a right side row by a simple yarn over to create the slant. In order to keep the stitch count constant, the last two stitches on each right side row are knit together to decrease one stitch. This process does create a slanted row, but it will cause the edge of the piece to also slant or scallop. It is the basis of the many patterns used for afghans in the chevron strip version, or the feathers and fan pattern. 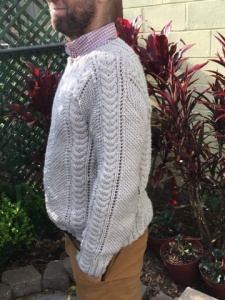 Since I did not want a scalloped or pointed edge on the sweater, this pattern starts with a standard knit-2 purl-2 ribbing, which is then bound off in the areas where the diagonal pattern will be used. 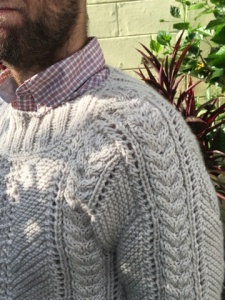 The diagonal is then created by the yarn over stitch increase on one side of each right side row and a second stitch increase made by knitting through the bound off edge of the ribbing. Once all the bound off stitches are replaced, the work is worked across on all stitches. The yarn over increases on one side of each panel are then offset by the knit-2 together decreases at the other end of each panel. This creates a nice shape, with gently sloping shoulders and a hollow for the neck. I felt the neck hollow was a bit too deep and wide, so I used short rows to build up the center a bit in the front, and fully in the back. This is an unusual pattern. The diagonal rows are not terribly obvious, but if done carefully, they can make a bit of a puzzler to show off your skills. This is called the “Starfish” because the pattern has 5 sided symmetry. 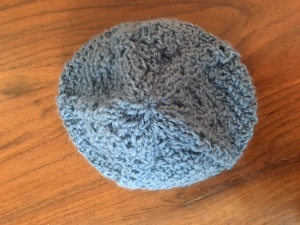 It is basically a simple watch cap with a ribbed start and the pattern carrying through as far as possible, until there are too few stitches remaining. 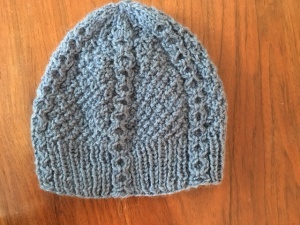 The background stitch in the main part of the cap is a double seed stitch.